On a bicycle, you can feel the battlefield advantage of making it to high ground. 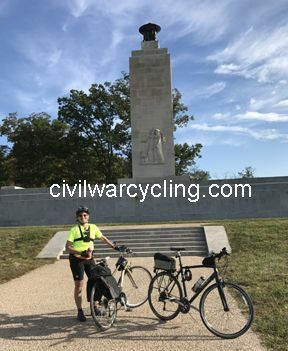 I had that experience on a bike ride to the Gettysburg Eternal Light Peace Memorial. 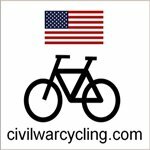 In the spirit of sharing what it is like to pedal up to Oak Hill, I posted my GoPro video of the ride on my Civil War Cycling Facebook page. 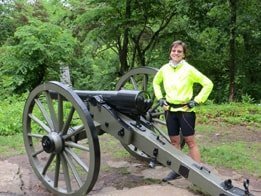 And in this blog post, I provide more geographical and historical context — plus a window to that bicycling video. Where is the Eternal Light Peace Memorial? The Eternal Light Peace Memorial is on Oak Hill, north of the town of Gettysburg, Pennsylvania. It was from here that Confederate artillery and infantry attacked the 1st Corps, Army of the Potomac, on July 1, 1863. President Franklin D. Roosevelt spoke at the memorial’s dedication on the 75th Anniversary of the Battle of Gettysburg in July, 1938. To symbolize peace between between warring sections of the country, Maine granite at the monument base joins the Alabama limestone column. An estimated one-quarter of one million people assembled on Oak Hill to celebrate the dedication of the Eternal Light Peace Memorial. Our video begins at the intersection of North Reynolds Avenue and Buford Avenue, where we turn left (west) and enjoy a subtle downward glide to about 560-feet Mean Sea Level. During this first leg of our short tour, we are riding down the west edge of Seminary Ridge. As we veer sharply right — still on Buford Avenue — and ride north, we begin a gradual but noticeable incline. Buford Avenue runs north toward Oak Hill and marks a battle line along which Confederate infantry attacked Union cavalry from the west. 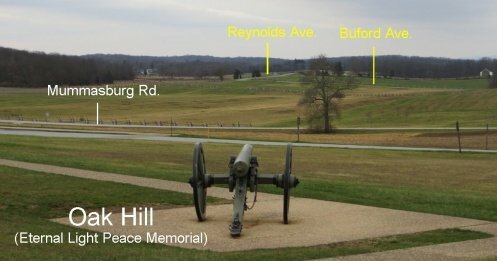 Buford Avenue is named after Maj. Gen. John Buford, the 1st Corps cavalry commander who held back Confederate Maj. Gen. Henry Heth’s infantry on the morning of July 1, 1863, until Union infantry under Maj. Gen. John F. Reynolds could arrive in Gettysburg. We follow Buford Avenue north all the way to the Eternal Light Peace Memorial at the top of the hill. According to the U. S. Geological Survey, Oak Hill stands at 616-feet Mean Sea Level, which means that we will have climbed about 56-feet. The next photograph was taken while standing just west of the Peace Memorial (January 1, 2016). Looking down from Oak Hill, you can see the roads a bicyclist would follow — from Reynolds Avenue to Buford Avenue and finally crossing Mummasburg Road to arrive at Oak Hill. 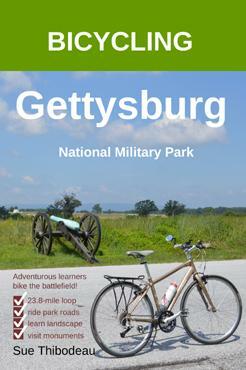 This entry was posted in Bicycling U.S. Civil War Battlefields, Gettysburg and tagged videos. Bookmark the permalink. 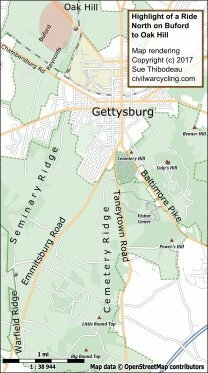 Previous Post: Where are the State Monuments at Antietam National Battlefield?